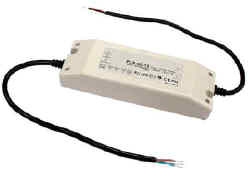 This LED transformer allows small DC LED products to be safely used when the only supply voltage available is line voltage AC. Special Note: Not currently compatible with the following IML PowerLED (PWL) Products: Norfolk PWL, Hatteras PWL, Portland PWL, Newport PWL, Sydney PWL. Dimensions (w x l x h): 1.73 x 7.17 x 1.57 in.